A Neon theme is a great idea for a birthday party! It is versatile and great for kids, tweens and teens of all ages. Neon party supplies and decorations are easy to find too! 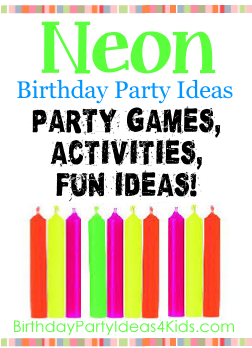 Enjoy these fun birthday party ideas with a Neon theme. Use a black plastic tablecloth as a background with neon colored streamers in front of it for a fun backdrop for the food table or a photo booth area. You can also use a black plastic tablecloth on the table and splatter paint neon colors on top of it. Buy the wooden letters of your child's name and spray paint them with a neon spray paint. Hang around the party as a fun decoration. Cut 3 inch circles out of neon paper. Sew the circles onto thick string to make neon garland to hang up around the party. Add glow sticks to balloons before you blow them up for fun glow in the dark decor! Cut out big rectangles from a thick pieces of black paper. Cut slightly smaller rectangles from neon colors of paper to attach on top of the black (so that the black shows on the edges). Write all of the party information on the neon colored paper. Have your child splatter paint the back of the invitation. Make your own neon twister game out of a white sheet and neon paints. To play you will need 2 neon or glow in the dark hula hoops. After splitting into two teams have children line up in two lines. Have each member of a team hold hands and tell them not to let go. Teams then try and get the hula hoop from one end of the line to the other and then back again without letting go of their hands. Use Neon colored balloons with small glowsticks inside of them. The object is for the players to keep their balloon in the air as long as possible. If it touches the floor they are out. To make this more challenging, yell out commands that each child must follow such as - Hop on one foot!, Use only your head!, Crawl on the ground! Give each guest glowstick necklaces and bracelets whenever they arrive at the party. If your birthday kiddo is older, ask all guests to come in white shirts. Get a blacklight or a strobe light (or both!) and have a dance party! You can also supply highlighters and neon markers for everyone to draw on their shirts with the markers. Make a ring toss game by taking three cans (Pringles cans work well) and filling them with beans/rice so that they will stay standing. Cover the cans in paper or paint. Make rings out of glow sticks and have each child try to throw the rings onto the cans. Supply each child with a white t-shirt or pillowcase for them to decorate. Use highlighters, neon markers, or glow in the dark paint. This doubles as a party favor! Supply neon nail polish for guests to paint their fingers and toes. Set up an art station with neon paints and paper for guests to paint. Use neon cupcake wrappers and dye white icing with neon food dye. Splatter the cupcakes or cake with neon icing. Make sugar cookies, but dye the batter neon colors to make neon cookies. Make long skinny cones by rolling up white paper and securing with tape. Place a glow stick inside of the cone and put cotton candy on top for a fun and visually cool treat! Dip pretzels/ Rice Krispies/ graham crackers in white frosting and drizzle neon frosting on top. Party favors for a neon party could include glow sticks, candy dots, neon colored silly string, pop rocks, glow in the dark stars, and twisted plastic straws in neon colors. Take black gift bags and splatter paint them with neon paints for a unique goody bag.